In northern Thailand, the wide Mekong River is known as Mother River. It travels from headwaters in the Tibetan plains over 4,000 kilometers to the South China Sea. But this year, the river has fallen to its lowest level in decades. Julian Wright manages a guest house on the Mekong River's banks at Khon Kaen in northern Thailand. Wright says there are more sand banks visible in the river than in past years. "I couldn't pronounce it being absolutely the lowest but it's certainly the lowest I've ever seen. The hopper that collects water from the town might find itself beached, then we might find we have a running water problem," he said. The Mekong runs through China's southern Yunnan Province, through parts of Burma, Thailand and Laos, and then moves through Cambodia and Vietnam before reaching the sea. This year, the dry season in Southeast Asia has been far drier than normal. And the southern Chinese provinces of Yunnan, Guizhou, and Sichuan are suffering a severe drought. Over 20 million people face water shortages with some 6.5 million hectares of crops affected. "This is a one in 50-year occurrence - with a return period of 50 years - so it's quite severe," says Ian Makin, an engineer and senior water resources management specialist with the Asian Development Bank. "Now the problem comes is that in the dry season most people that are cropping in the Mekong Basin are using pumps and when the water level drops further than normal they can't let water out into their fields and they're struggling to keep the crop alive." In towns, water resource officials have asked communities to conserve water. Barges and ferries normally plying the river have been forced to halt services, because in some areas, the river is nearly dry. And in low-lying areas in Vietnam's fertile Mekong delta, the drought means salty ocean water can move onto farm land, damaging the soil. Environmental and rights organizations in Thailand say dams on waterways in southern China contribute to the river's low levels. The Save the Mekong Coalition, an alliance of environmental groups, criticizes China's management of the river and dams built in China. "It's not a natural drought - but it's also the impact from the large scale infrastructure which is the dam upstream and the fishermen and farmers have been suffering from the change of the eco-system of the Mekong River very much. And they suspect that this is because of the way the damming upstream controls the water flow," said Pianporn Deetes, a coalition spokeswoman. China has completed the Xiaowan hydroelectric dam, the second largest hydro-electric station in the country, on the upper reaches of the Mekong. Eight others are being built in Yunnan Province. Jeremy Bird heads the Mekong River Commission, made up of Cambodia, Laos, Thailand, and Vietnam. He dismisses concerns about the dams and blames the drought for the low water levels. "Looking at the flow records that we have, we see no reason to suggest any operation of those projects upstream has made the situation worse. In fact, there's some evidence to suggest that if those dams had not been in place then the lower water levels may have been experienced even earlier in January," said Bird. 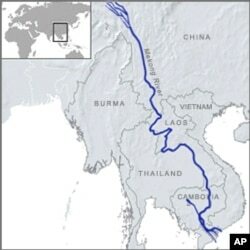 Sensitivities over the Mekong's flows have led to talks between China and Thailand on how the dams may affect water levels. Chinese officials reject claims the dams contribute to low water levels. Early next month, China will attend a summit of leaders from Mekong River nations in Bangkok. The leaders hope to find ways to better manage the river. There are fears that rising populations will mean increased use of the Mekong for drinking water, farming, fishing and transportation. Smith Dhanrmasaroja, head of Thailand's National Disaster Warning Center, thinks Southeast Asia may eventually face conflicts over water. "Of course they will fight. Each country they will fight for water. We will have a war, a water war in this region and people when they need to water to drink you know they will fight for everything. So conflict between Lao, Thai, Myanmar, Kampuchea (Cambodia), that thing is going to happen - we will wait and see," he said. In a report released this week, the United Nations Economic and Social Commission for Asia and the Pacific expressed similar concerns about water security in the region. The report warns that water shortages in the region are likely to be exacerbated by climate change.